← The “Black Irish” – Who Are We? L.O.L. 456 Known as “Murdocks Lodge”! In my 2012 trip “back home” I amassed a large number of documents, some dating back to the late 1700s; old photographs (some still unnamed); and many photos of family headstones from a variety of cemeteries. One of the documents I came across was a small booklet entitled “A Short History of Ballymoney Lodges L.O.L 456,954, 956” written by Roy McComb. Ballymoney is a small town and civil parish in Co. Antrim, Northern Ireland where many generations of my family where born and resided until their deaths. “A Short History of Ballymoney Lodges L.O.L 456,954, 956” written by Roy McComb. 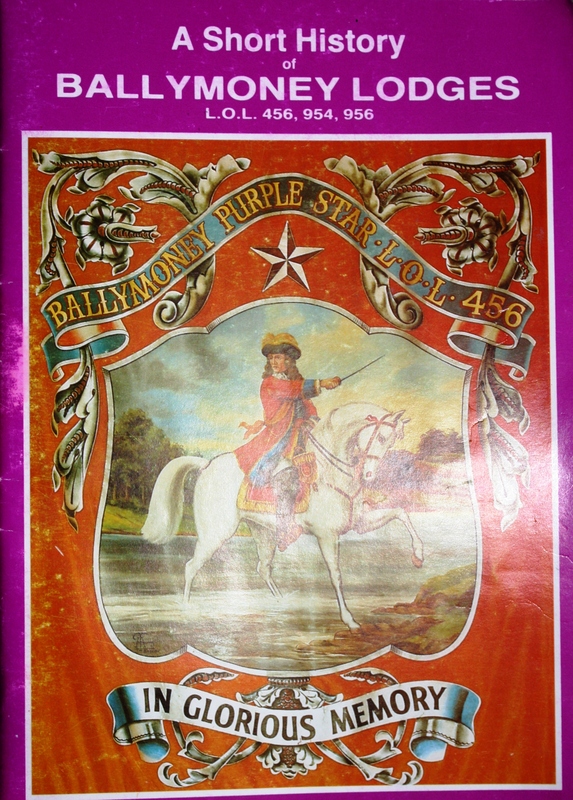 I had often heard the story that the Ballymoney Purple Star L.O.L 456 had so many members who were Murdocks it was locally known as “Murdocks Lodge”! Well, now I have it in writing! 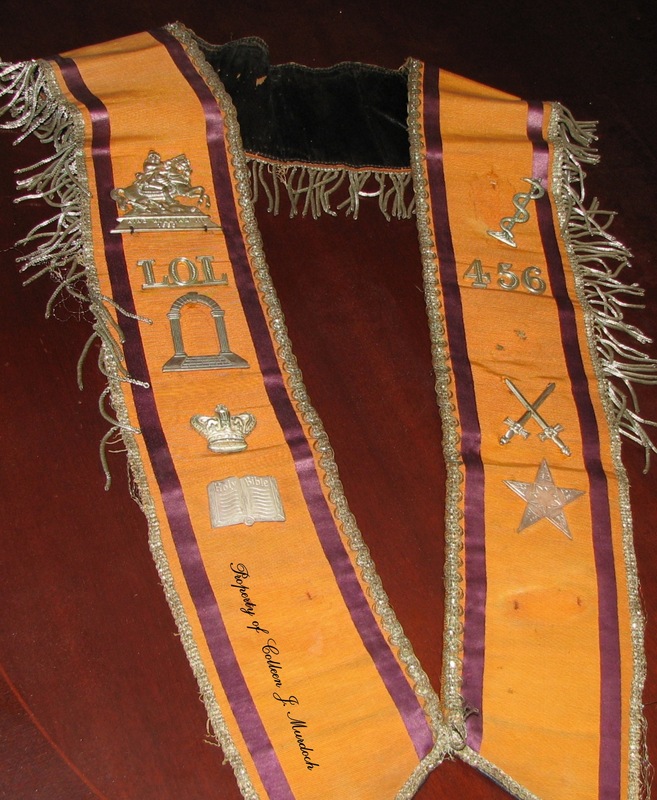 The Sash My Great Grandfather Wore! 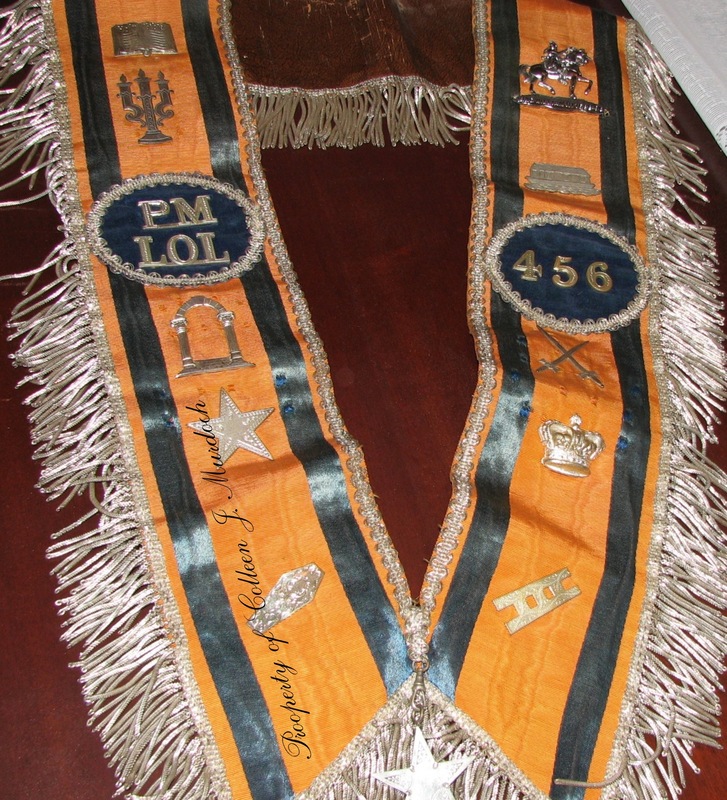 The Sash My Grandfather Wore! Another excerpt lists Worshipful Masters for the period from 1824 to 1987 and shows that William Murdock (my great uncle) was Master of the Lodge from 1954-1955; and from 1963-1968 Robert Murdock (my grandfather) was Master. You will notice that I have spelled my great grandfathers name as MurdocK and my grandfathers as MurdocH! That is purposeful… my grandfather always insisted that his ancestors, who he said “hailed from Scotland”; spelled our name with an “H”! This entry was posted in Co. Antrim, Family History, Geneaology, Ireland and tagged Ballymoney, Murdoch Family, Orange Order. Bookmark the permalink. 3 Responses to L.O.L. 456 Known as “Murdocks Lodge”!